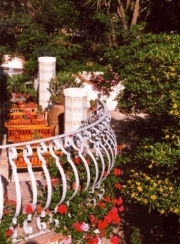 The Tirreno Residence has the same characteristics of the island of Procida, wich is sunny and quiet which slow and calm rhythms. It is located in the green heart of the island, in the charming place named "Faro" (lightouse) which is not very from the port of Marina Grande. The hotel is just 80 metres away from the sea in a clean and quiet of coast, the ideal for a swimm or a diving. The Tirreno Residence is situated in a quite park with two buildings for the lodgings. All rooms are comfortable and cool in the summer too. The single-roomed lodgings have a furnished room with 1,2 or 3 beds, an equipped cooking area, air conditioned ( or fan) heating, private bathroom with shower, TV, fon, frigobar and radio.The two- roomed lodgings have an additional room and can have until 5 beds. The lodgings have a furnished patio on the courtyard. The single-roomed lodgings have a double bed and are as big as the two-roomed lodgings. The lodgings have the exit with furnished patio on the courtyard. There are also mutual courtyards that are shaded with lemon trees. 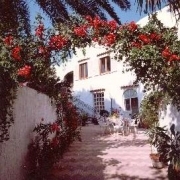 The external places of Tierreno Residence have been often used for photographic services on the subject “Villas of Mediterraneo” and they have been film sets. Tirreno Residence offers you a quite and comfortable place with staff assistance day and night. Beds-clothes included in the price. Heated rooms in winter. Since the Tirreno Residence is present in the Touring Club Guide in the section ”Hotels of quality with a low price”, it means that in Italy the residence is one of the best Hotels for the connection quality-price. Satellite-TV. Board and lodging on request. Internet included in the price. Service security safe free. Free fax and the possibility to phone free the foreign countries . Major credit cards accepted. Service laundry. Close and free parking. In summer minibus to all beaches of the island. All the year around open.